HVAC – heating, ventilation, and air conditioning – is one of the most critical systems in a safe and comfortable home. A properly functioning HVAC system does a lot more than simply keep your home cool in the summer and warm during the winter. In fact, it’s an important part of keeping your family healthy, since improperly purified air can be a contributing factor in the spread of colds, the flu, and other illnesses. Not only that, when the weather is at its harshest, during the bitter cold of winter or the blazing heat of summer, your HVAC system will keep your family safe from dangerous temperatures. Even a minor problem with your air conditioner can cause it to work a lot harder, forcing it to pull a great deal of extra electricity to get the job done. If you don’t contact an HVAC service and have the issue dealt with quickly, you’ll find yourself spending a lot more on energy over the course of time. Eventually, the cost of ignoring the issue will eclipse the cost of having a certified technician fix it. In many cases, the issue that’s costing you money will be something simple, such as old filters that just need to be replaced. The last thing you want to deal with during the scorching heat of July and August is a broken AC unit. The temperatures can often creep high enough that they actually pose a health risk to people living in the home, particularly young children and the elderly. Similarly, during the icy months of December and January, having a broken heater could risk the health of you and your family if the issue is not addressed immediately. Having a disruption in your HVAC service during extreme weather is a problem most homeowners would like to avoid, which is why issues should be addressed as they come up and not just when they cascade into greater problems. Have your HVAC unit regularly inspected and repaired as part of a Planned Maintenance Program like the one offered by Entek HVAC. It’s also best to do this during the offseason. 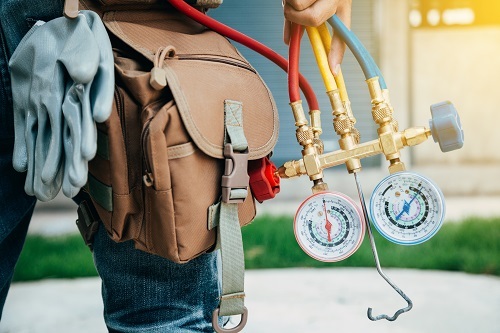 If you avoid preventive maintenance until your HVAC service is extremely busy, such as during the months of June through September or December through March, then you’ll often have to wait if the issue isn’t emergent. As with most problems in life, simply ignoring them won’t cause them to go away. In fact, they’re likely to become worse until the time and expense required to solve them are unbearable. That’s why it’s important to address HVAC issues as soon as you become aware of them. In many cases, however, you won’t become aware of any issues until something actually breaks down. Emergency repairs can be a real headache – not to mention costly – so it’s best to avoid them whenever possible. One example of a minor problem that can quickly balloon out of control is a damaged thermostat. Often, your HVAC unit will be functioning just fine, but the thermostat itself will not read the temperature correctly. This will cause the unit to stop and start at inappropriate times and put undue stress on its mechanical parts. Eventually, all of the extra wear and tear will lead to a breakdown of the system. This can be easily avoided by inspecting and replacing the thermostat early on. All the extra stress on the mechanical components of an improperly cared for HVAC system will add up over time. Ultimately, this will greatly shorten the life of your heating and air conditioning system and ultimately force you to replace it, often at great cost. A well-maintained system, on the other hand, will use less energy, become less strained, and last a lot longer. Over the life of your home, you’ll save a great deal of money if you just give your HVAC system the care and maintenance it requires. An improperly functioning HVAC system can do more than lead to an uncomfortable home. It can also do damage to the home itself. One of the most common examples of this is an air conditioning leak. Any number of seemingly minor problems can cause your air conditioner to develop a leak. When that happens, the fluid that seeps out of it can warp and damage the area around it and even contribute to the growth of toxic mold. Something as simple as a clogged filter can prevent air from ventilating properly, which can also spread bacteria and viruses to the various rooms in your home. The damage caused by a faulty HVAC unit may or may not be covered by your homeowners’ insurance, and if it isn’t, you could incur some very serious repair costs. Extending the life of your HVAC system is one of the biggest benefits of proper preventative care. However, all too often, homeowners attempt to extend the lives of their HVAC systems a little too long. Once a unit has outlived its useful life, the cost of repairs becomes greater than the cost of simply replacing the whole unit. In some cases, homeowners even throw away thousands of dollars in extra heating and cooling costs because the HVAC unit that came with their home wasn’t the right fit and not nearly as efficient as the systems today. Today’s modern heating and air conditioning systems are more powerful, more intuitive, and more energy efficient than ever before. If you have an older system or an otherwise out of date one, reach out. We are properly licensed and equipped to handle regular maintenance, repairs, and system upgrades. Connect today for a free estimate.